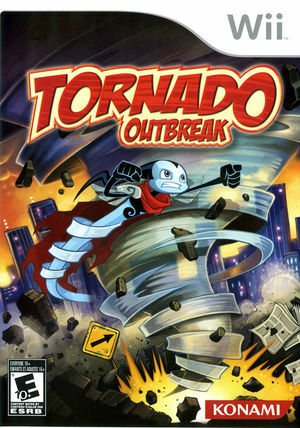 Harness the power of a raging tornado and battle the forces of evil in an effort to save the world in Tornado Outbreak! Sinister forces have deceived players to believe that their destructive behavior will save an epic hero. In reality, they're working for evil. Players must take control of a dynamic tornado to tear through open environments, chew up the landscape and spit out everything in the way. The more destruction, the bigger the tornado grows. Work against time based, collection and point challenge, players search for hidden elements and enemies from another world. As the debris flies and the trail of destruction is left behind, players must battle bosses and defeat the forces of evil. Tornado Outbreak uses the VP6 video codec, common in Electronic Arts' titles, causing it's videos to have vertical line artifacts and other glitches on NVIDIA graphics cards. The Software Render will display VP6 video correctly, but is typically too slow. Prior to 4.0-593 video output was completely scrambled, refer issue 5046. Rendering improved with 4.0-593 but a variety of glitches remain, refer issue 7193. VP6 rendering also reacts poorly to the Force Texture Filtering enhancements (and Anisotropic Filtering on NVIDIA), causing further scrambling. XFB Real is required for some FMVs and loading screens to appear. Fixed with Hybrid XFB in 5.0-5874. This code runs Tornado Outbreak at 60FPS, but it will still drops to 30FPS when too much is happening. Overclocking may account for that. The graph below charts the compatibility with Tornado Outbreak since Dolphin's 2.0 release, listing revisions only where a compatibility change occurred. This page was last edited on 27 February 2018, at 10:27.